As far as the backyard garden at casa de radmegan goes, most of my vegetables have ceased production for the season. The pitchers on my carnivorous plants are browning. My sweet little alien-like conophytums and lithops were covered up last week to protect against too much rain. On the whole, my garden has closed up shop for the winter. This is a super easy and rewarding way to keep a little green on your thumb this winter. And as lots of water plants require over-wintering, it’s really a win-win for you and your plants. – A glass container, bowl, wide-mouth vase etc. 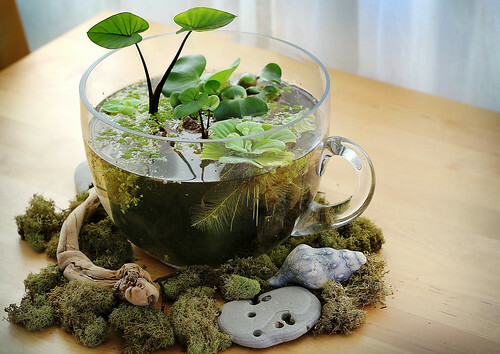 – Water plants such as taro, water lettuce, water hyacinth, duck weed, fairy moss etc. 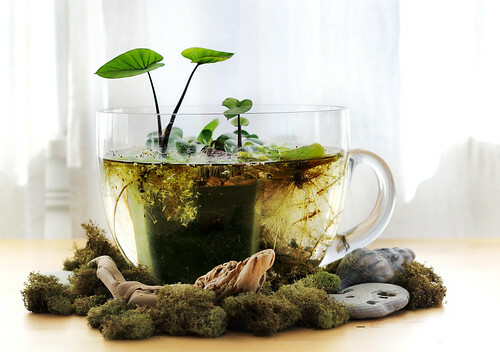 – Pure waterPlace the taro in your plastic pot and add soil. Pack the soil down snugly and cover with rocks and pebbles. Rinse off any loose soil from the exterior of the plastic pot. Make sure your bowl/vase/container is clean and free of cracks. Take a handful of charcoal and line the base of the vessel to help against odors. Cover with aquarium pebbles. Fill the vessel with the most pure water you can get your hands on; rain water, reverse osmosis water, or distilled. Place the potted taro into the vessel. Some loose soil may escape the pot- just scoop it off the top of the water, and add more rocks to the potted plant if needed. Pull off any dead roots from the floating water plants, and give them a good rinse before adding to the bowl. If you plan on taking the water garden outside, and then bringing it back inside later, mosquito fish are a good idea. Nobody wants mosquitoes hatching in their living room! One last note on water gardens- many water plants can be extremely invasive and destructive when introduced to natural bodies of water, so if you find yourself needing to dispose of any extra plants, please throw them in your compost heap, or trash bin and do NOT put them in streams, rivers or lakes.